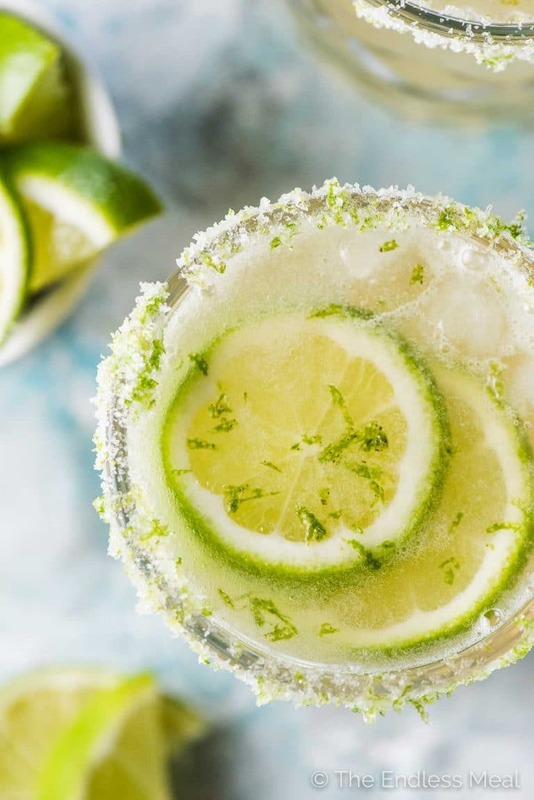 Fizzy Lime Margaritas are bubbly, refreshing, and perfect for afternoon sipping. Make one and relax on the patio or make a pitcher to share with friends. ¡Salud! They're bubbly and bubbly cocktails = awesome and refreshing. They're super simple to make. Tart lime juice + sweet agave syrup + delicious tequila + bubbly club soda. No weird tasting ingredients here. Bye bye, icky lime cordial and tubs of premade margarita mix. Don't let the door kick you on the way out! No refined sugars. That's right, these babies are sweetened with a touch of agave syrup. I like the subtle flavor it adds and its better for you sugar status. 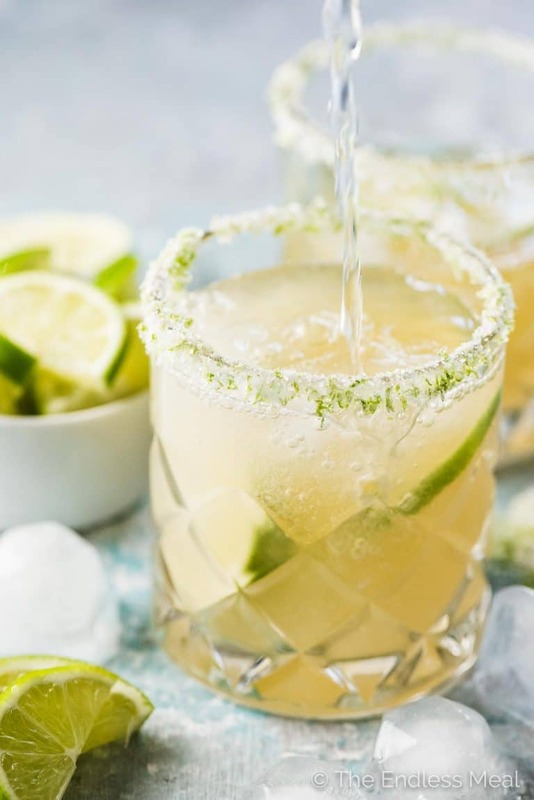 These margaritas are the perfect thing to serve anytime you want a delicious but lighter cocktail. Think wedding showers, Sunday brunch, picnics in the park, BBQ parties, you name it. PS. if you're wanting a laugh, scroll down to just below the recipe to see the picture of the half empty (glass half full?) picture I originally shared with this recipe. ? Sitting here in my chilly apartment, staring out at the overcast skies, sunny Mexico seems like a long ways away. I have ten more long days to wait before I board my Air Canada flight, first to Cuba for a week and a half, and then to Mexico for another week and a half. While I anxiously wait for the next ten days to pass I will be dreaming of beaches and sunshine while sipping on Fizzy Lime Margaritas. I feel better now that I've shared that with you. If I could read the future, I'd say there are lots of Fizzy Lime Margaritas in store for me. I hope I'm not wrong. This version of a traditional margarita is a lot lighter, less boozy, and slightly fizzy. I'm tempted to call it a margarita spritzer, but that just sounds too girly. Tart lime, strong tequila, and fizzy soda water come together to make a refreshing summer cocktail. This would be equally as good sipped on your backyard patio as it would on a beach in Mexico. 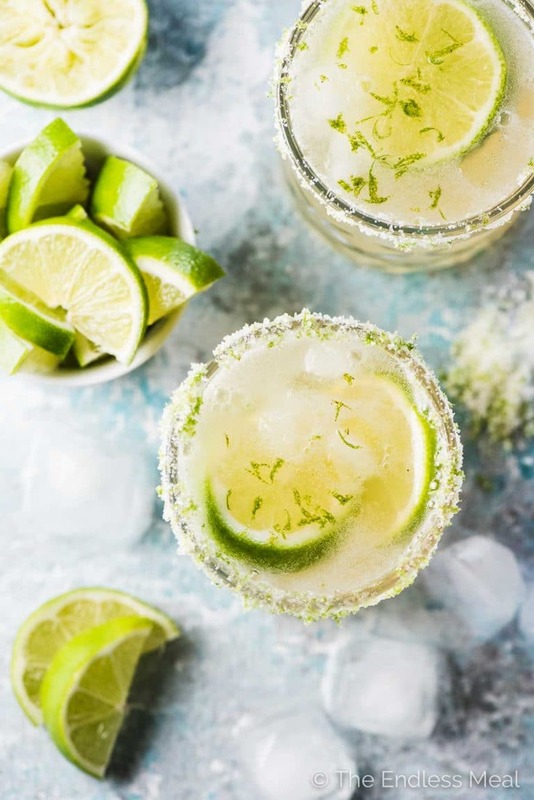 If you love these Fizzy Lime Margaritas as much as I do, make sure to give them a 5-star review in the comments below! Stir the lime zest into the salt then place the lime salt on a plate. Wet the rim of a glass with a cut piece of lime then roll the wet edge of the glass through the lime salt. Add the tequila, lime juice, and agave over ice in a cocktail shaker or mason jar and shake well. Pour your margarita into the rimmed glass and top with soda water. Any bubbly water works in this recipe. I usually opt for Pellegrino or club soda. To make this for a party, add 2 cups of tequila, 1 cup of lime juice, and 1/3 cup of agave to a large pitcher with ice. Stir until the agave dissolves then top with soda water. I call this a gentleman’s drink. It’s a total Friday night drink! Now that summer is upon us, I’ve been looking for cocktails. Thanks for this one, can’t wait to try it. You’re so welcome! Happy summer!! This was the best margarita I’ve ever had! I never would have thought of adding bubbly water but it totally makes it. So refreshing! I felt the same way, too. So happy you liked it! Perfect for the hot Summer days to come. 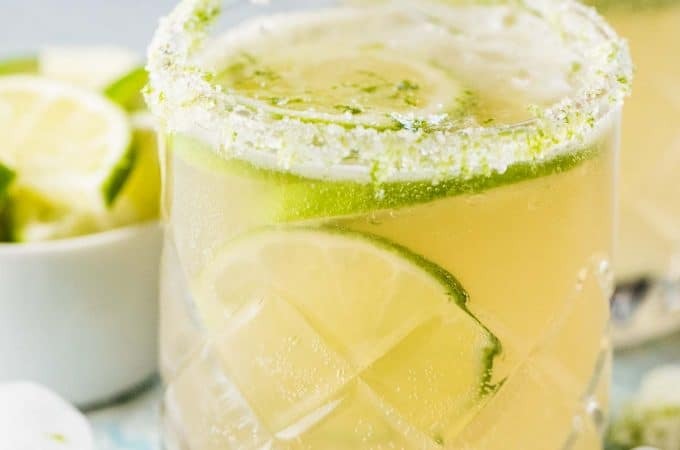 I posted a margarita recipe last year — and I had read the same thing about tequila being a good choice for paleo — tequila doesn’t raise your blood sugar level like other alcohols. That definitely puts margaritas into the health food category, right? Save me one — I’m coming over! This fizzy version is right up my alley. I like the way you think! Tequila = health food for me! Yum – sounds light and refreshing!